Plan Curtail makes the case for a radical shift in our approach to climate change. We focus on developing ways that individuals can take responsibility for significantly reducing their CO2 emissions. In our view, efficiency and renewables are only one part of the solution. 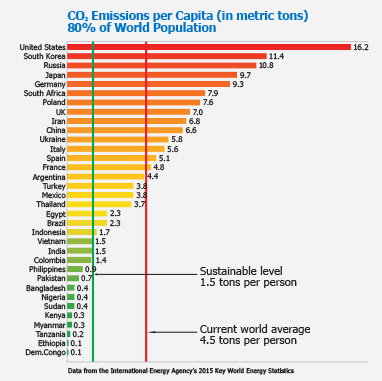 A large part of the effort must involved cutting back or curtailing everyday energy use.This graph displays the magnitude of the reductions that the U.S. must achieve to reach the sustainable level of 1.5 metric tons per year of CO2 emissions per person by 2050. Today, on average, each of us in the U.S. produces more than ten times our share. 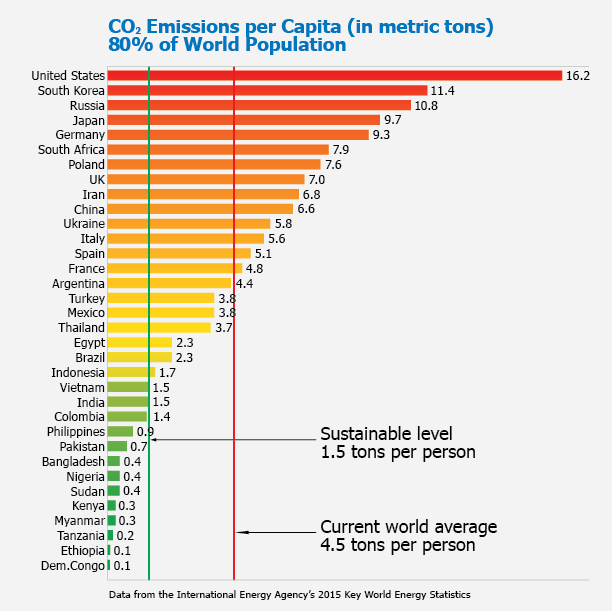 The graph also highlights the tremendous gap between the high emissions of rich countries and the low emissions of poorer ones. To help individuals meet their responsibility to make large reductions, we offer a numerical model of CO2 generation in housing, cars, and food. Using this model, all energy consumers can begin to track their personal emission reductions and see which choices will make the most difference.